Eating healthy is the need for today. But with so much to do sometimes healthy cooking takes a back seat. But one is constantly feeling guilty about it. 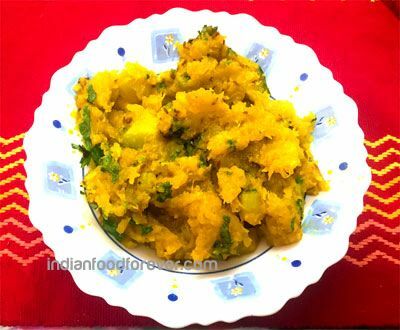 So here is one such recipe – the very humble khatta metha kaddu ki sabji. A real Time Saver recipe. It is easy and quick to cook and at the same time it is delicious and nutritious too. It is perfect for lunch or dinner or for that matter even breakfast if served with some paratha or puri. It can be part of tiffin or lunch too. You can further reduce the time by precutting the kaddu or pumpkin well in advance. The key here to make it low calorie sabji is to use minimum oil. So use a measuring teaspoon and use ½ teaspoon oil. Just enough to let the jeera seeds sputter. Rest of the cooking is done by adding little water. Let’s take a look at how dry pumpkin sabji Indian style is made. Serve Khatta Meetha Kaddu with: With boondi raita, green mint chutmey, chapatti or paratha or puri. Peel the pumpkin and wash it. Chop it into ½ inch pieces. Keep aside. Now in a heavy bottom pan/kadai, heat oil add asafeotida and jeera and let jeera sputter. Now add methi dana and julienned ginger. Fry it for a minute and then add green chillies. Add turmeric, red chilly and coriander powder and a tablespoon of water as not to burn the masala. Immediately add kaddu pieces and salt. Mix properly. Add ¼ cup water, cover and cook on medium flame till the kaddu pieces get soft and mashed. If need be add a tablespoon of water and let the kaddu cook in its own steam. Remember not to add too much water or the sabji will lose its crunch. It should take 10 – 15 minutes depending upon the quality of the pumpkin. Keep stirring it occasionally and if need be keep adding a tablespoon of water till fully done. Once fully cooked add the gur(jaggery). Let it dissolve completely and then switch off the flame. Finally add the lemon juice and chopped green coriander. Important: It is important to remember to add lemon juice once the flame is switched off or the lemon gives bitter taste to the sabji.